Spo12 is a key component of the FEAR network, involved in the regulation of mitotic exit in budding yeast. Spo12 activity is tightly regulated during the cell cycle and is turned over by the proteasome in an APC/CCdh1-dependent manner as cells enter G1. Here, Kamura and colleagues provide evidence that Spo12 is also degraded in G2/M phase and identify the HECT-type ubiquitin ligase Tom1 as a novel E3 ubiquitin ligase that potentially contributes to the turnover of Spo12 during this phase. The results reveal new aspects regarding the regulation of Spo12 activity during the cell cycle. Chlamydia are obligate intracellular bacteria and their host cell invasion requires the virulence protein TarP. TarP is able to bind and recruit the mammalian protein Vinculin, which anchors adhesion complexes to the actin cytoskeleton through its interaction with the focal adhesion protein Talin. The study refines our understanding of the molecular mechanism underlying chlamydial infection by characterizing the interaction between TarP and Vinculin. The authors report that TarP is able to out-compete Talin-Vinculin complex formation and suggest that TarP is able to alter vinculin-mediated cytoskeletal connections during chlamydial infection. Late endothelial progenitor cells (LEPCs) are circulating blood stem cells that home to sites of vascular injury and promote wound healing through their angiogenic functions. Here, the authors show that treatment of LEPCs with the inflammatory cytokine interferon gamma (IFN-g) enhances their adhesion to endothelial cells (ECs). 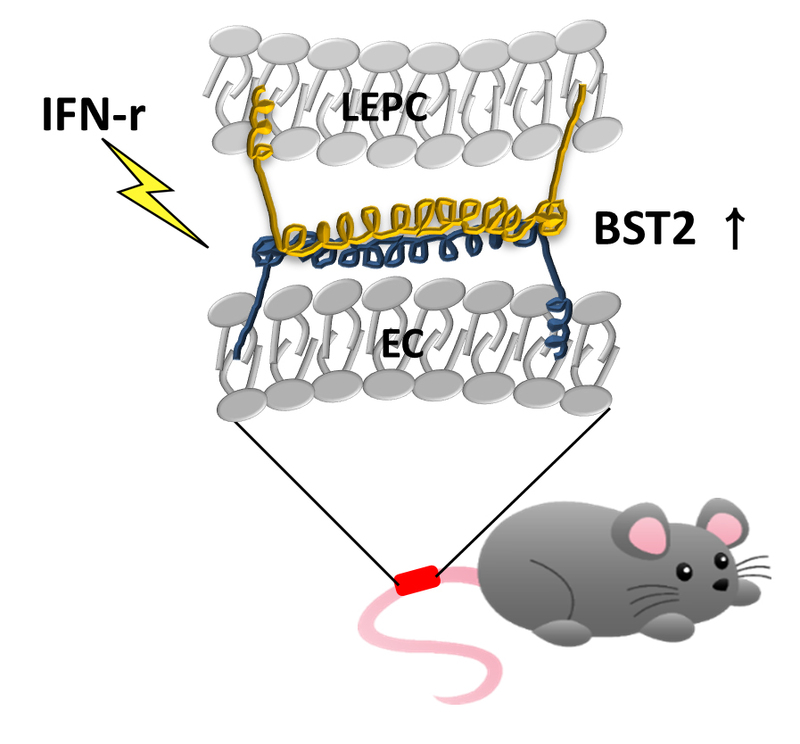 IFN-g treatment upregulates expression of the transmembrane protein BST2 in LEPCs, and BST2, through homophilic interactions of its extracellular domain, promotes the adhesion of LEPCs to ECs. IFN-g also enhances the angiogenic function of LEPCs. In vivo, IFN-g-treated LEPCs have superior therapeutic effects on wound closure. These findings pave way for improving LEPC-based therapy. Spastin is a microtubule-severing enzyme that functions in axon regeneration, cytokinesis, and nuclear envelope sealing after mitosis. Mutations in the gene encoding spastin result in the neurodegenerative disease hereditary spastic paraplegia. 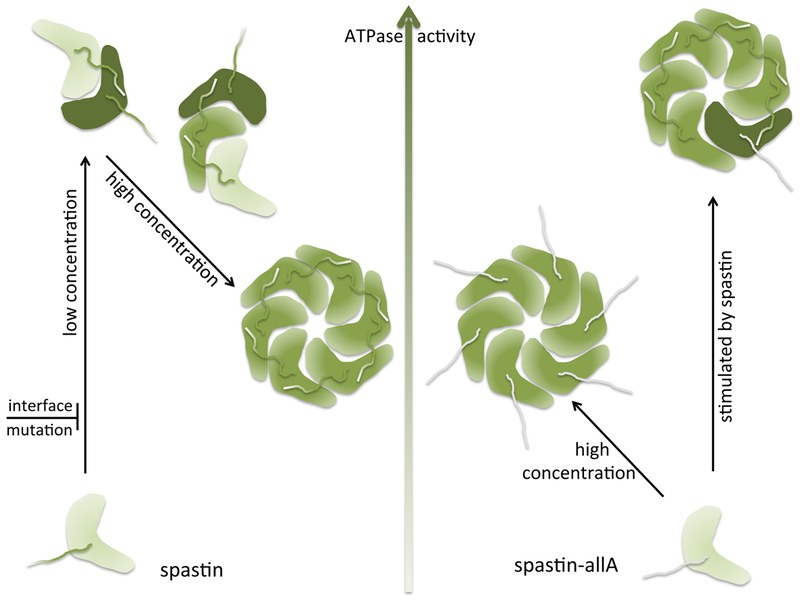 Spastin contains an AAA ATPase domain at its C-terminus which is required for its function. Here, the authors find that the microtubule-binding domain (MTBD) of spastin, located N-terminally to the AAA domain, regulates both the inter-subunit interactions of the AAA domain as well as its ATPase activity. 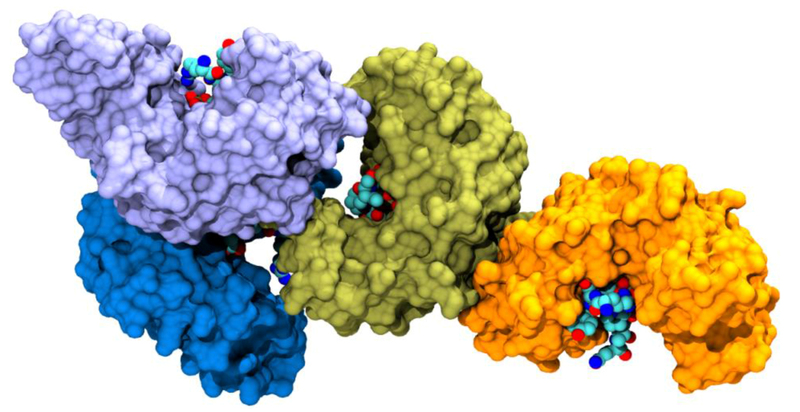 The study, thus, reveals a novel role for the spastin MTBD and provides insights into the regulation of the protein’s ATPase activity. Mitochondrial ion channels are involved in the regulation of mitochondrial membrane potential, apoptosis and cell excitability. Their dysfunction is linked to a variety of pathological states such as Alzheimer’s and Parkinson’s disease. 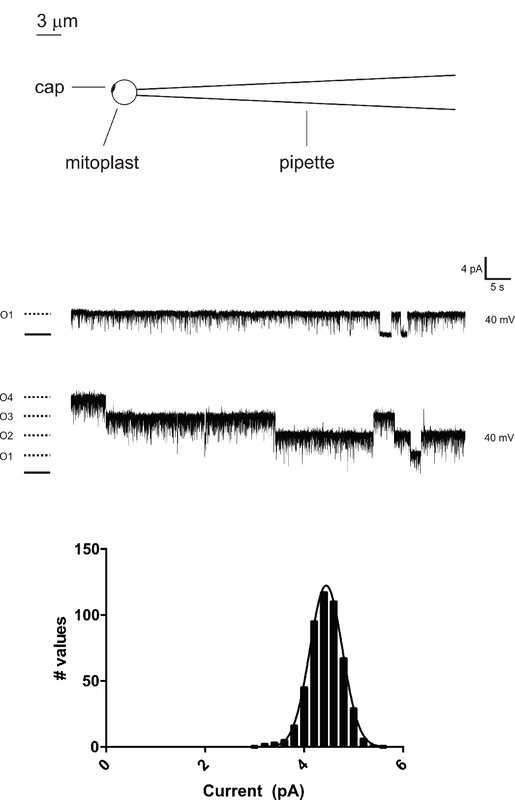 Here, the authors report the properties of a large-conductance chloride channel recorded from the native inner membrane of mitochondria isolated from rat brain. Their findings are a first step towards understanding the physiological role of brain mitochondria ion channels and developing novel therapeutic strategies for the treatment of neurological diseases. Aggregates of α-synuclein (αSyn) are one of the neuropathological hallmarks of Parkinson’s disease. Here, Rovere et al. 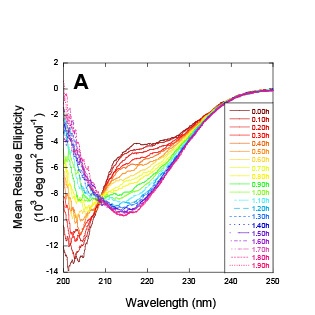 analyze a novel soluble α-helical conformer of αSyn and report how lipid interfaces chaperone the refolding of the intrinsically disordered αSyn. The authors suggest that membrane-bound αSyn maintains a helical fold and could consequently undergo homo-oligomerization. Constant membrane remodeling might shift this equilibrium towards the pool of disordered monomeric αSyn and could favor nucleation events and subsequent aggregation. The eukaryotic translation initiation factor 1 (eIF1) plays a central role in start codon selection by discriminating against noncanonical start codons. 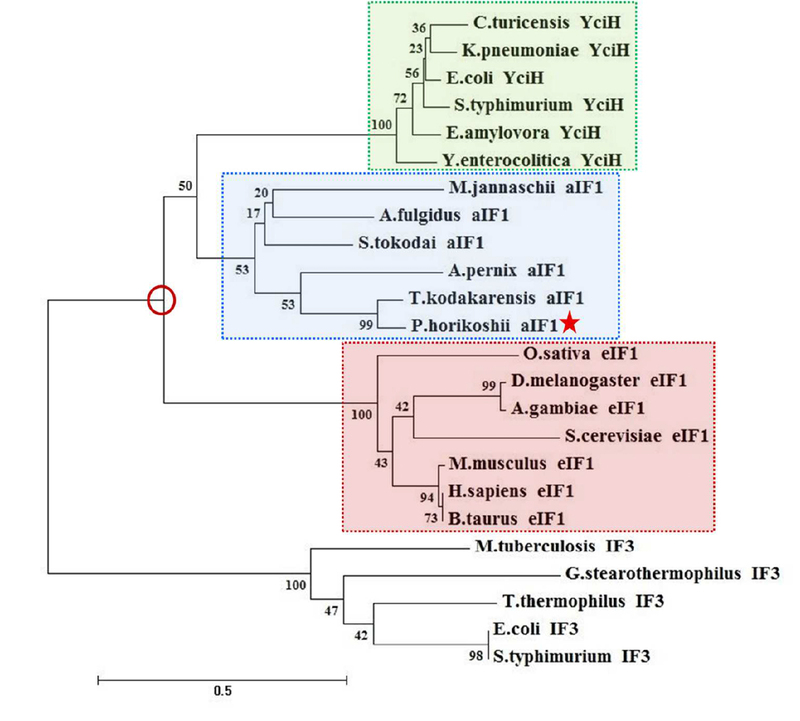 It is conserved in all three domains of life, with aIF1 being the functional homologue in archaea. Here, the authors present the crystal structure of aIF1 from Pyrococcus horikoshii OT3 and perform a comparative structural analysis with its eukaryal and bacterial counterparts. The findings reveal significant differences in the proteins at functionally relevant loop regions connecting antiparallel b-strands. The study provides intriguing insights into how the unique structural features of aIF1 contribute to its function in translation initiation. Rhamnolipids (RLs) are microbially produced surface-active compounds (biosurfactants) that are involved in bacterial motility and biofilm formation. Here, the authors show that RLs secreted by the opportunistic pathogen Pseudomonas aeruginosa during colonization of the gastrointestinal tract promote aggregation of the Parkinson’s disease (PD)-associated protein α-synuclein (αSn). While monomeric RL is able to interact with αSN, fibrillation of αSN is induced by RL micelles. The study discusses the implications of the αSN-RL interactions for the host and for bacteria, while providing insights into gut microbial metabolites in αSN aggregation and PD pathogenesis. TRIM24 (tripartite motif-containing 24) is a ligand-dependent corepressor of the nuclear retinoic acid receptor alpha (RARα). Here, the authors reveal a novel role for TRIM24 in regulating the proteasomal degradation of ligand- and DNA-bound RARα by serving as an adaptor linking RARα to the proteasome. Upon induction with retinoic acid (RA), both TRIM24 and the proteasome are recruited together with RARα to RA-response elements in the promoters of target genes, where they regulate RARα transcriptional activity by mediating its degradation. Thus, TRIM24 and the proteasome are shown to be intrinsic features of RARα transcriptional activity. The mitochondrial respiratory chain cytochrome bc1 complex couples electron transfer from ubiquinol:cytochrome c oxidoreduction to the generation of a protonmotive force for ATP synthesis. Inhibitors of the bc1 complex target either the Qo or Qi quinol binding site and serve as drugs against the malaria parasite Plasmodium falciparum. Here, the authors show that the endochin-like quinolone ELQ-400 targets both Qo and Qi sites, thus explaining its effectiveness against P. falciparum strains resistant to single site-targeting drugs. 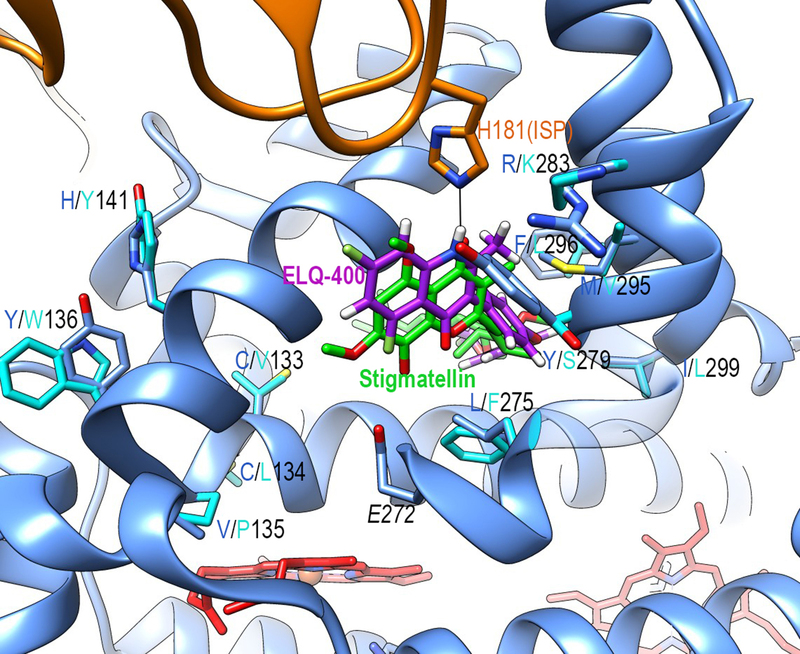 The insights from dual site inhibition by ELQ-400 may enable the design of drugs to overcome acquired drug resistance in P. falciparum. The RING-domain containing protein RNF11 is a subunit of the A20-ubiquitin-editing complex, which regulates NF-κB signalling. The RING domain is presumed to confer E3 ubiquitin-protein ligase activity on RNF11. Here, Day and colleagues report that the RNF11 RING domain binds the E2 ubiquitin-conjugating enzyme Ubc13 and Ubc13~Ub but does not efficiently promote polyUb chain synthesis. Instead, the authors suggest that RNF11 modulates the availability of Ubc13 for other E3 ligases and acts as an inhibitor of ubiquitin chain assembly in NF-κB signalling. Membrane fusion during synaptic exocytosis depends on the efficient formation of a SNARE complex composed of the plasma membrane bound SNAREs syntaxin-1 and SNAP-25 and the vesicle membrane bound synaptobrevin-2/VAMP2. 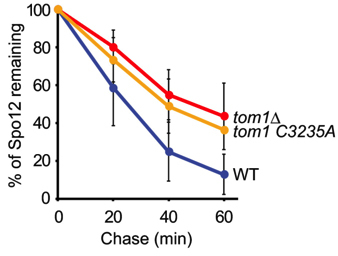 Tomosyn is believed to inhibit SNARE complex formation by forming a nonfusogenic complex with syntaxin-1 and SNAP-25 preventing synaptobrevin-2 association. Here, the authors show that the regulatory proteins NSF and a-SNAP are able to disassemble the inhibitory tomosyn-syntaxin-1/SNAP25 complex, and subsequently, SNARE complex formation is enabled via the accessory proteins Munc18-1 and Munc13-1. The ubiquitin-specific protease 8 (USP8) impedes epidermal growth factor receptor (EGFR) downregulation and is usually inhibited by binding to 14-3-3 proteins. Mutated USP8, impaired in binding to 14-3-3, leads to increased activation of EGFR and is often found in patients with Cushing’s disease (CD). Here, the authors characterize the interaction between USP8 and 14-3-3, offer a structural explanation for the role of USP8 mutations in the pathogenesis of CD and provide a foundation for the development of new potential therapeutic strategies. 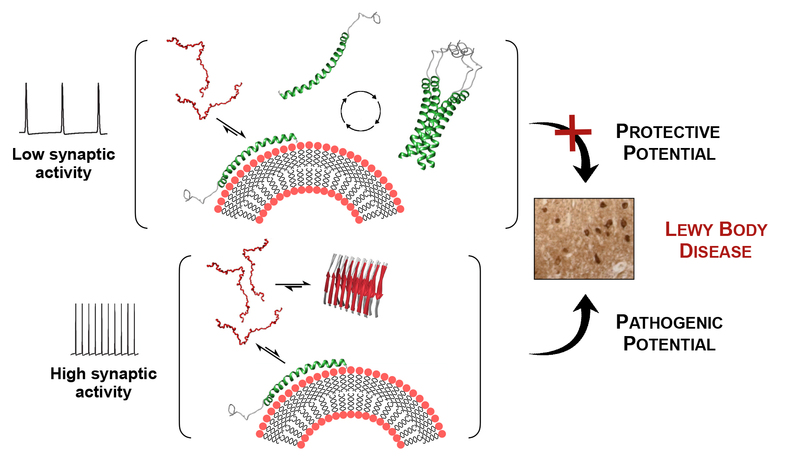 Matrix metalloproteinases (MMPs) function in numerous biological processes by degrading extracellular matrix components and proteolytically processing bioactive molecules. Deregulated MMP activities are implicated in various diseases, including cancer. 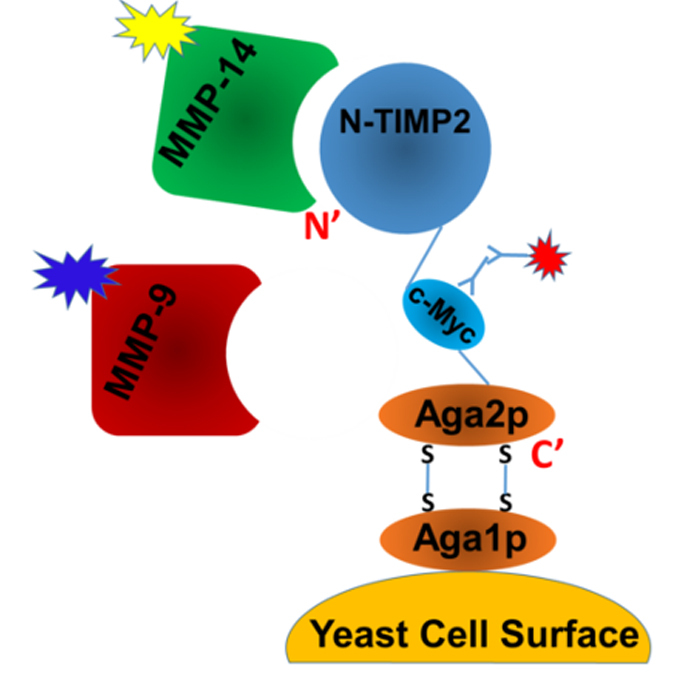 Here, using a natural broad inhibitor of the MMP family as a scaffold for mutagenesis and yeast surface display technology, the authors engineer specific inhibitors for the membrane-bound MMP-14 and the secreted MMP-9. The study provides insights into the design of drugs targeting specific MMPs.